Diabolical scheme to divide up Italy and restore the Papal States exposed!! Michele Sindona (1920-1986) St. Peter’s Banker. Michele Sindona. Pope Paul VI’s banker and confidant. Born in 1920 in Patti, Sicily. Sindona became the most successful tax lawyer and the most powerful banker in Italy. Years later, as one of the wealthiest men in the world, Sindona was identified by the Italian and U.S. governments as the Mafia’s banker. He was accused of washing heroin profits through his banks and of smuggling currency out of Italy through the Bank of the Vatican. In 1972 Sindona purchased controlling interest of FRANKLIN NATIONAL BANK. Two years later FRANKLIN NATIONAL BANK collapsed — the 2nd largest bank failure in U.S. history. On August 2, 1979, while under indictment, Michele Sindona disappeared and was believed to have been kidnapped by left-wing terrorists. He reappeared on October 16, 1979, was later convicted of bank fraud, and was sentenced to twenty-five years in prison. Sindona was extradited back to Italy in 1984 and sentenced to 25 years in prison for the murder of investigative lawyer Giorgio Ambrosoli. Sindona had an encyclopedic knowledge of his fellow conspirators, and even in prison, he could still “sing” to reduce his sentence. “Dead men tell no tales” so Sindona was “suicided” by a cyanide capsule in 1986. Franklin National Bank Chairman ruined Rockefeller’s Presidential attempt!! Nelson Rockefeller was “elected” Governor of NY State in 1958. In 1960, he decided to run for President as the Republican candidate against John F. Kennedy. Rockefeller already “owned” the NY vote but he needed the key state of California in order to be a viable candidate. As governor, Nelson passed an omnibus banking bill which favored his giant banks against the small independent banks. One of those banks was owned by Arthur T. Roth. Arthur T. Roth (1905 – 1997). Arthur T. Roth was a banker with a human face. He was responsible for the growth of a small country bank into the 18th largest bank in the country. He did this by sheer hard work and determination. As he sought to expand his bank, he ran into opposition from Governor Nelson Rockefeller. Here is a quote from Mr. Roth: “I’d had several clashes with David Rockefeller over branch banking. Starting in 1958, I came into direct personal conflict not only with David but with his brother Nelson; and this went on over several years. It first came into the open during hearings on the new omnibus banking bill in Albany in February 1958. A good part of the legislature was present, because we’d sent telegrams to each assemblyman and senator the night before, saying that if he wanted to learn the answer to the bank controversy, to come to the legislative chamber the following day.” (Ross, The People’s Banker: The Story of Arthur T. Roth and the Franklin National Bank, p.163). Arthur T. Roth investigated the Rockefellers!! Arthur T. Roth decided to investigate the shady banking practices of the Rockefellers. He noticed that the giant NY banks were lending large amount of money in California. “I sent three Franklin officers to California to investigate at first hand where the billions of dollars of “flight money” from New York savings banks were going, and how they were being used. They went around to housing developments in Los Angeles and found that most of the mortgage money came from New York. Californians could get a 100-percent mortgage — no money down on a house — and sometimes even more than 100 percent. This was illegal. It worked like this: A builder would apply for a mortgage for $15,000, but only $13,000 went to pay for the house; the other $2,000 was cash to the purchaser to buy furniture or pay moving expenses. But it was all bank money, and the entire loan was guaranteed by the U.S. government.” (Ross, The People’s Banker: The Story of Arthur T. Roth and the Franklin National Bank, p.165). Mr. Ross compiled all the facts on the illegal Rockefeller lending scam and when Nelson was leaving for California he presented the report to him . . . and the reporters…. “Governor Rockefeller, although only in his first year in office, had already begun to try to launch himself into the presidency of the United States; he wanted to become the 1960 Republican candidate. As part of his campaign, he had hired a large private airplane and invited about thirty reporters to go with him on a visit to the key state of California in November 1959 to see what political support he could cultivate for himself at the 1960 Republican National Convention. As he and the reporters boarded the plane, we handed each of them our “blot sheet” and some supplementary information, including a copy of a letter I had written to Superintendent Clark about the horrible lending record of the New York savings banks. that veterans in New York State understand from painful personal experience. This difference in treatment of veterans and other home buyers is the primary reason why housing in New York State has declined so fast in contrast to the favorable showing for the rest of the country. And I referred him to the team of Franklin officers investigating New York State mortgages in California, who were stopping at a Los Angeles hotel. Rockefeller was locked into his airplane for hours with thirty reporters asking him questions about the blot sheet. When he got to California the local radio and television people were alerted to question him, too. We invited him to visit California developments and see at first hand where New York savings were going, but of course he never did. A good personal friend of mine, who was in a position to know, told me that at a subsequent directors’ meeting of a Rockefeller enterprise, the conversation was largely about our blot sheet and the effect it had had on the governor. (Ross, The People’s Banker: The Story of Arthur T. Roth and the Franklin National Bank, pp. 166-168). Rockefeller’s wrath was later shown in the destruction of the Franklin National Bank by the mafioso Michele Sindona. 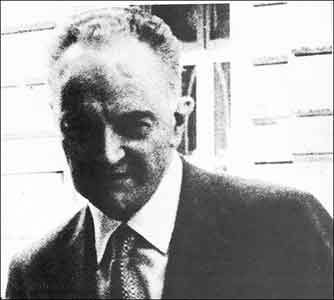 Michele Sindona was in Sicily to organize a Pentagon coup d’état against the Italian government!! The unification of Italy began in SICILY in 1860 when Garibaldi landed with his famous 1,000 red-shirted volunteers. The dis-unification of Italy began when the Pentagon controlled the Mediterranean after World War II. Once a precedent had been set and Sicily had successfully seceded,the Pentagon expected that the other regions of Italy would follow suit, with the end result of the Papal States restored to the Pope!! “In 1947 the Christian Democrats had suffered a major setback. The Mafia, the Christian Democrats, and the outlaw Salvatore Giuliano together formed the framework of a separatist movement that invited the United States to annex Sicily. Support for the separatists was believed to be strong. A poll taken just before the elections of that year revealed that a majority of Sicilians did not share a political identity with Italy. The United States rejected the separatists’ offer to annex Sicily, but with U.S. assistance Italy agreed to grant autonomy to the island. The Sicilian parliament would have complete control of provincial matters; however, Italy would have power over the island’s foreign policy.”(DiFonzo, St. Peter’s Banker: Michele Sindona, p. 32). “A year before his disappearance, Sindona had come to know Rear Admiral Max K. Morris, who was then in New York as a Pentagon representative to the United Nations. Admiral Morris shared Sindona’s belief that Sicily was an island of supreme strategic importance to the future of the world’s democratic powers. On September 20 of that year, on stationery of the Royal Thames Yacht Club, the admiral wrote to tell Sindona that he had discussed his ideas with Admiral Stansfield Turner, the director of the CIA, who was with him then in England for the annual meeting of the Institute for Strategic Studies. On October 6, from his home in Jacksonville, Florida, Admiral Morris wrote again, to say that “the meetings of the Institute for Strategic Studies pointed up many of the acute problems we discussed.” After a long telephone conversation, the admiral informed him, in a letter dated December 13, that “Both a High Military Figure and a similar person in the intelligence field” were giving “interested attention” to “the information you gave me.” He said that while there was “no way to determine if either of these people will carry the matter further, I certainly urged them to do so.” He concluded by saying that “all of us,I know,appreciate your efforts in behalf of this country and of the West.” (Tosches, Power on Earth: Michele Sindona’s Explosive Story, p. 203). Sindona handed them a copy of the letter from Real Admiral Max K. Morris. “See? It is true,” he said. “We can do this. But I need two hundred more men.More guns. If you help, I will grant all mafiosi amnesty for crimes committed before the coup. But all drug trafficking must stop. All Mafia crimes must end. I want Sicily to be clean. If any Mafia family does not accept this, I will have soldiers drag the bosses into the streets of Palermo. The peasants will spit on them. They will see that these gangsters are nothing, that they are stupid people, animals. Then I will have the soldiers kill them in front of everybody. No one will fear the Mafia any more. Rosario Spatola kissed Sindona’s hand, a Sicilian gesture of respect. He said he would do whatever Don Michele thought was right, but first he would have to speak with the head of the Gambino family in New York and with his people in Sicily”. (DiFonzo, St. Peter’s Banker: Michele Sindona, pp. 239-240). “He (Sindona) believed so totally in his version of reality that he searched his files and located a letter he had received from retired Rear Admiral Max K. Morris, dated October 13, 1978. Sindona proudly presented the letter to his family and friends as proof that the U.S. military and the CIA were backing his Sicilian coup.” (DiFonzo, St.Peter’s Banker: Michele Sindona,p.239). Some of the other people involved in the Sicilian coup!! Licio Gelli known as the puppetmaster was the head of a Masonic Lodge entitled P2 or Propaganda Due. Propaganda Due, or P2, is a secret masonic lodge that Licio Gelli joined in 1966, later to become its Venerable Master. P2 is neo-fascist, but in Italy during the 1970s, this did not preclude conspiracies with anarchists,leftists,terrorists,and the CIA. Gelli holds dual Italian-Argentine citizenship, and was connected with Italian police and intelligence agencies, as well as with the Mafia, financiers, and the Vatican. By March 1981, his time was running out. Police raided Gelli’s villa in Tuscany and photographed a list of nearly a thousand members of P2. – and 58 university professors. The Italian government of Arnaldo Forlani collapsed during the ensuing scandal. Roberto Calvi was known as “God’s Banker” for his links with the Vatican Bank. He was the chairman of Banco Ambrosiano in Milan and a central figure in a complex web of international fraud and intrigue. In May 1981, Mr Calvi was arrested, found guilty, and sentenced to four years’ imprisonment, but released pending an appeal. Roberto Calvi was to be tried for alleged fraud involving property deals with Sicilian banker Michele Sindona, who was himself serving 25 years in the U.S. over the collapse of the Franklin National Bank in New York in 1974. On June 19, 1982, he was found hanging from Blackfriars Bridge in London with 2 bricks in his pocket. Naturally his death was ruled a SUICIDE!! Archbishop Paul Marcinkus was the head of the Vatican Bank from 1971 to 1989. Bishop Paul Marcinkus known as the Gorilla was the bodyguard for Pope Paul VI and Pope John Paul II. He became head of the Vatican Bank in 1971 even though he had no banking experience. In 1972, he bought all the shares of the Banca Cattolica del Veneto and sold them to Roberto Calvi at a hugh profit. The Banca del Cattolica del Veneto was run for the people of Venice by the Patriarch of Venice, Cardinal Albino Luciani. The night Albino Luciani a.k.a. Pope John Paul I was poisoned, Paul Marcinkus was found walking in the courtyard of the Vatican Bank about 6:45 A.M. Marcinkus lived at the Villa Stritch on Via della Nocetta about 20 minutes from the Vatican. He was not known as an early riser. God’s Banker found hanging from Blackfriars Bridge…Special report from the BBC. St. Peters’ Banker: Michele Sindona. Franklin Watts, New York, 1983. People’s Banker:The Story of Arthur T.Roth & Franklin National Bank. Keats Publishing Co., New Canaan, Conn.,1987. The Failure of the Franklin National Bank. Challenge to the International Banking Community, Columbia University Press, 1980. Power On Earth: Michele Sindona’s Explosive Story. Arbor House, New York, 1986. The Vatican Exposed: Money, Murder and the Mafia. Prometheus Books, Amherst, New York, 2003. Yallop, David. In God’s Name: An Investigation into the Murder of Pope John Paul I. Bantam Book, New York, 1984. Posted in The Family'sTagged Nelson Rockefeller, Rockefeller, David Rockefeller, Arthur T. Roth, Franklin National Bank, Michele SindonacommentLeave a Comment on The Rockefeller-Pentagon-Mafia Connection! !